With renewed Air Force and Naval partnerships, a new office to support military-affiliated students, and a notable uptick in the number of students participating in the Army program, the Reserve Officers’ Training Corps is experiencing a renaissance at Brown. PROVIDENCE, R.I. [Brown University] — On the days she takes afternoon leadership classes with the Patriot Battalion of the Army Reserve Officers’ Training Corps at Providence College, Kaela Lynch gets a lot of questions from her fellow Brown University students. Lynch doesn’t mind. She said enjoys the chance to explain ROTC. “We’re trying to get the word out because it’s a really great opportunity and a lot of people just not knowing about it is why a lot more people aren’t taking advantage of it,” she said. To be sure, a Brown University student in full Army fatigues is a rare sight — there’s just Lynch, senior Johnathan Davis, sophomore Caleb Walters and first-year student William Summers. But by recent statistics, four is a bumper crop and there may soon be more military officers in training at Brown. This summer the University signed contracts to resume its relationships with the Navy and Air Force by joining programs at College of the Holy Cross and Worcester Polytechnic Institute, respectively, in Worcester, Mass. That restoration follows votes by the Corporation and the faculty during the last few years to re-engage Brown’s long dormant Navy and Air Force ROTC partnerships (the Army partnership never ended, but in some years there were no active Brown students). Over that same recent timeframe, the University also established an Office of Student Veterans and Commissioning Programs to ensure students with military careers — in their past or in their future — have a supportive home on campus. Writing earlier this year in the Brown Alumni Magazine, President Christina Paxson described how the military’s acceptance of gays and lesbians in 2011 paved the way for a rapprochement between Brown and ROTC programs decades after Vietnam-era antiwar sentiments led to votes that ended their presence on campus. “A campus committee commissioned in June 2011 by then-President Ruth Simmons made the case that Brown students should be given every opportunity to serve their country, even while recognizing the imperative that the military make progress on its enrollment policies,” Paxson wrote. When Davis, who is from Stockbridge, Ga., joined ROTC in 2013, the revival was in the midst of taking shape. There was only one other student cadet, Philip Smith, and when he graduated in May 2015, he became the first ROTC cadet to do so at Brown since 2009. 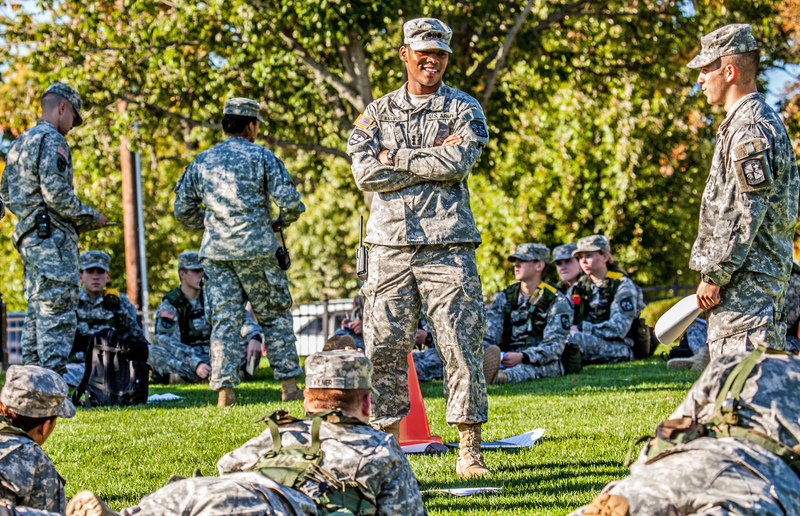 As a senior at Brown, Johnathan Davis served as the presiding officer at an October exercise on Pembroke Field. Davis, however, saw many reasons to join, despite the substantial demands it heaps upon a student’s schedule. High on the list, Davis says directly, is that ROTC is what has allowed him to stay at Brown. Cadets can earn merit scholarship awards and stipends that cover up to all four years of tuition. “Toward the end of my freshman year, I’m going to be honest with you, my parents were telling me, ‘Johnathan, Brown is very expensive. You should look into other avenues for funding your education,’” he said. But Davis and Lynch were also attracted to the opportunity that ROTC provides to serve. 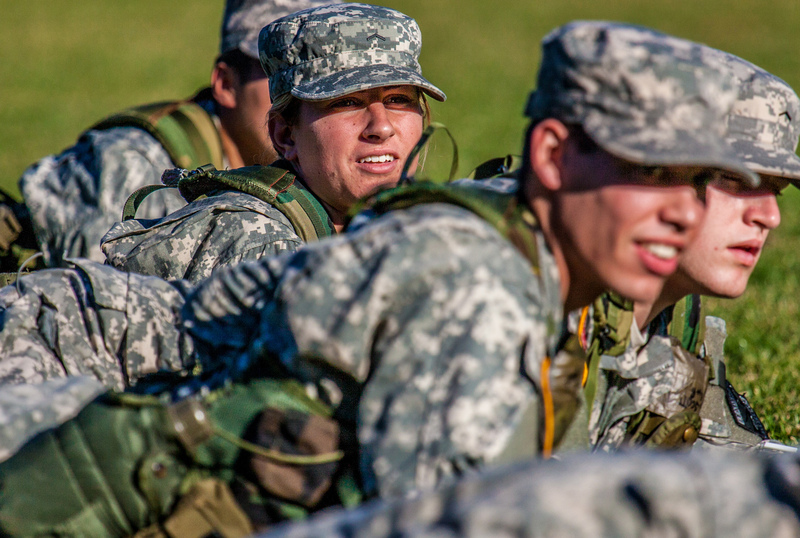 After graduation, cadets become officers in the Army, either active duty or Army Reserve, for at least three years. Davis, meanwhile, is concentrating in biomedical engineering (he does research on a hydrogel microparticles for drug delivery) but he is also interested in communications and intelligence work for the Army. He can help keep fellow soldiers safe, he said, by establishing sound communication lines and providing timely and accurate information. Lynch said the instruction that cadets receive in leadership will be valuable inside the Army and outside, too. “It’s applicable in so many situations,” she said. And then there is also the deep sense of belonging and purpose that cadets say they have found in abundance in the Patriot Battalion, made up of students not from PC, Brown, Bryant University, UMass Dartmouth, Johnson & Wales University, Rhode Island College, and Community College of Rhode Island. This is not solely aspirational. Both Davis and Lynch came to their decisions to enroll with significant exposure to what military service is like. Davis’ older brother serves in the Army and he has two cousins in the Marines (as his uncles were before them). Lynch’s father is an Army colonel and command surgeon stationed at a base in Stuttgart, Germany. Lynch, in fact, refers to Stuttgart as her hometown. Lynch said the uniform raises questions on campus, but said she enjoys explaining ROTC and the military to fellow students. Davis said he’s gained additional wisdom about military life from speaking with the student veterans he often sees at the Office of Student Veterans and Commissioning Programs, headed by program director Karen McNeil. Part of building community for military-affiliated students is not only forging bonds among them, but also, as Lynch appreciates, demystifying military service for the broader campus. A particularly visible effort took place in full force Oct. 7, when the whole Patriot Battalion took to Pembroke Field for a monthly training called a “leadership laboratory.” This is the second year the battalion has conducted one at Brown. As Brown’s senior cadet, Davis planned this year’s event and served as the officer in charge. On the field, a junior is given a mission to carry out as a squad leader with younger cadets as the rank and file. They start with classes on how to march a squad, for instance, through hostile territory where an ambush could be imminent. Then they carry out the exercise, giving everyone a drill on the quick decisions that have to be made under fire (in this case, of course, entirely hypothetical). As Davis looks back in his senior year on a dual career as a Brown student and an Army officer in training, he does so with fondness for both. For however many students opt to do so, the groundwork has now been laid, not only by administrative moves, but also by the presence and efforts of the student cadets themselves.